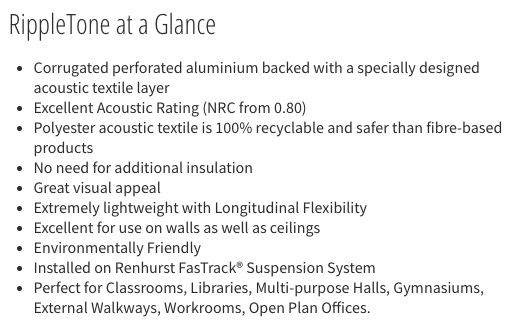 The founding principle of the Renhurst Ceiling Range was to focus on sound absorption, however, many designers worldwide are using Renhurst metal ceilings for their superior performance acoustic properties as well as the dramatic architectural curves. Ripplesound and Rippletone ceilings make up the Renhurst acoustic ceiling range. 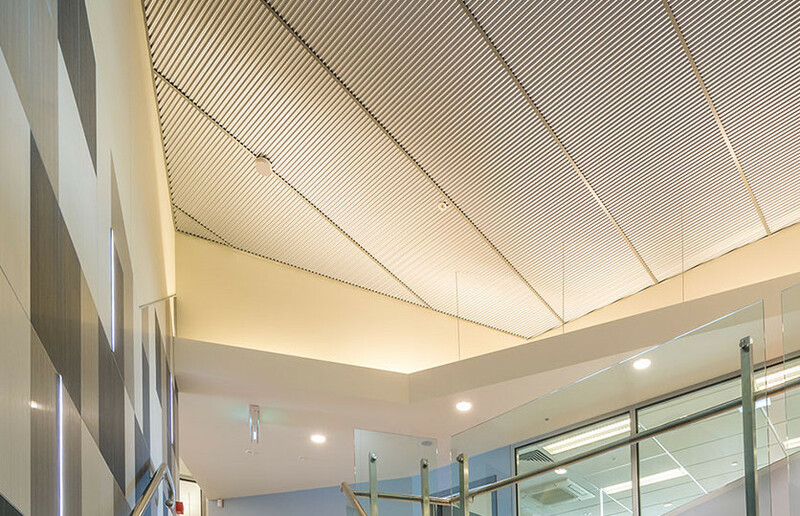 They can be used to form full ceilings, floating or feature panels for ceilings, infill’s, walls and decorative features with minimal weight loadings. 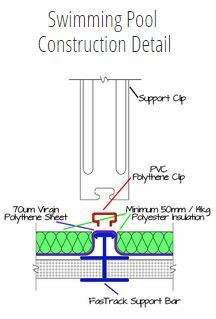 Renhurst ceiling systems are installed using the FasTrack support system which can be suspended or fixed directly to the roof purlins. Tests and specifications are available upon request. Ripplesound is well known for its high performance in sound absorption and thermal insulation. It is made up of a corrugated, perforated aluminium which uses thermal / acoustic polyester insulation to block and break down sound. 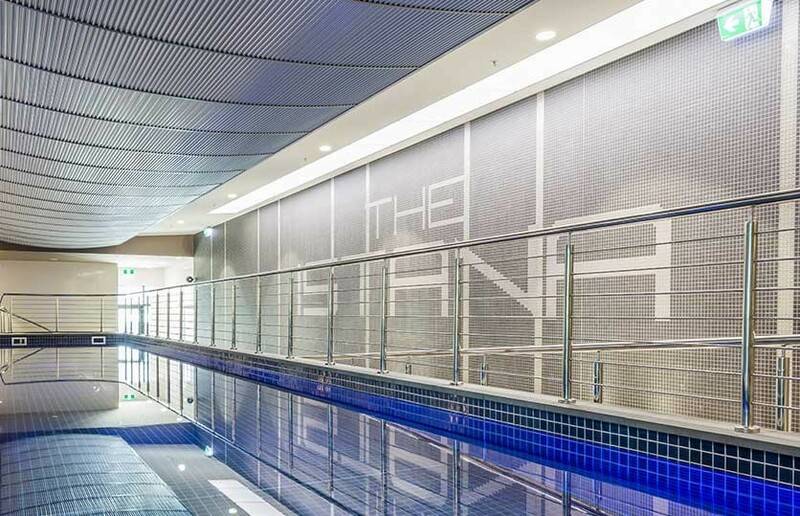 Ripplesound installed with Renhurst Polythene Vapour Barrier, has become the ceiling of choice for many aquatic centres. Designed for harsh swimming pool environments, Ripplesound assists in controlling the moisture levels of the area. 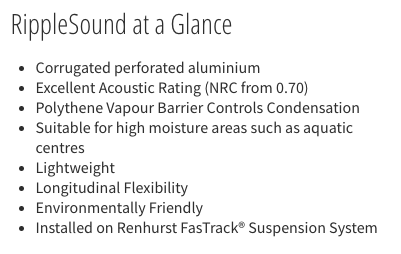 Ripplesound achieves an excellent acoustic rating with an NRC from 0.70. Rippletone is made up of corrugate, perforated aluminium with a uniquely designed polyester acoustic textile adhered to its reverse. Due to the polyester backing Rippletone easily achieves a NRC of 0.80. Rippletone is 100% recyclable as a polyester backing is used over against a fiber based product. Rippletone delivers improved sound insulation, reduced weight and simpler installation at less cost.